Elizabeth Rodman, originally from Boonville, Missouri, is a final-year student pharmacist from the University of Missouri-Kansas City (UMKC) in Kansas City, Missouri. Prior to attending pharmacy school, she completed her undergraduate coursework at UMKC. She served as APhA-ASP Chapter President for 2015-2016 and UMKC Student Government Association Senator for 2014-2015. Elizabeth is also actively involved with several pharmacy organizations, including the Missouri Pharmacy Association, Missouri Society of Health-System Pharmacists, Greater Kansas City Society of Health-System Pharmacists, and Phi Lambda Sigma. In addition to organizational leadership, Elizabeth completed an internship within the VA Learning Opportunities Residency (VALOR) Program and recently completed the 2016 AACP Walmart Scholars Program. She has presented posters at national meetings regarding diabetes self-care and academic programs. 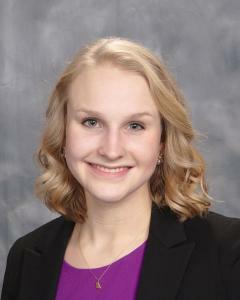 Elizabeth is currently employed as a pharmacy intern at Saint Luke's Hospital of Kansas City and plans to complete a PGY1/PGY2 combined residency in health-system pharmacy administration after graduation. As a practicing pharmacist, she aspires to continue to expand the role of pharmacists in providing patient care services. Elizabeth would like to acknowledge her family, friends, and mentors for their constant support and encouragement throughout her time as a student pharmacist.